My name is Gijs van de Wetering, 23 years old. I obtained my MSc. 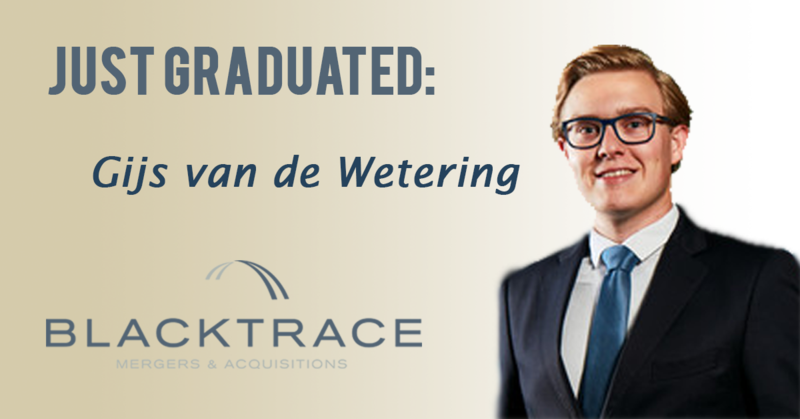 Finance diploma in August, 2017 and currently work as junior M&A specialist for Blacktrace, an award-winning, independent, and international M&A specialist. In this article I would like to talk about how I experienced the transition from being a student to being an employee and why I chose to pursue a career in M&A. My life as a student began with the BSc. Economics and Business Economics, which is basically an upgraded version of the more common BSc. Business Administration. This studies enables you to develop a broader economical mindset. In my second year I decided to put theories into practice and started investing (although some might call it trading) in stocks. While analyzing stocks and companies, I realized that I wanted to specialize further in finance. A logical next step was the MSc. Finance program, together with 200 highly motivated, internationally oriented students. This program offers a lot of optional courses, allowing students to customize their program in order to successfully land a job within their preferred field. I experienced a strong but positive competition from my fellow driven students, who all wanted to achieve an above average GPA, which made it both a fun and educative experience. In 2015, I attended Investment Night, a symposium with prominent investors who discuss the current investment climate and try to transfer their knowledge to the students. After this successful edition, I was eager to organize such an event myself, and 3 months later I was one of the new members of the Investment Night 2016 committee. On top of all the amazing (in)formal activities, working in a committee or board provides you with organizational and semiprofessional experience that closes the gap between studying and working. You also get the opportunity to meet many enthusiastic professionals and ambitious students, which helped me a lot when I was looking for a starter’s job. After organizing Investment Night, I became chairman of A&F Investments, the investment club for Tilburg University students. The two other board members and I were responsible for hosting the bi-weekly meetings, portfolio management, recruitment of new members, acquiring partners, administration, and organizing (in)formal activities such as guest lectures, visits and quarterly drinks. Overall it was the perfect stepping stone for my career and therefore I recommend everyone to acquire some extracurricular experience. Currently I am proud working for Blacktrace as junior M&A specialist. M&A appealed to me not only because of the financial aspects, but also due to its multidisciplinary and dynamic aspects. M&A is a field on its own, where specialists have to possess deep knowledge of finance, accountancy, (fiscal) law, strategy, psychology, and negotiations. Every company and every industry is different, so you continuously have to dive into the business model, the organization and the industry trends. I favored Blacktrace over other M&A firms because of 4 main reasons: (1) it is a relatively small boutique with 10 employees, (2) the pragmatic attitude, (3) the deal size, EBITDA >€3m, and (4) the location: ‘s Hertogenbosch. Within a smaller firm, you are given more responsibilities and freedom, and communication lines are shorter, hence you are aware of almost all developments. A pragmatic approach is very important to me, as I prefer to stay focused on delivering relevant and reliable output, instead of incorporating a lot of fuzz around the principle goal. Our clients, mostly family firms and experienced, successful entrepreneurs, want us to sell their company because of this DNA. Blacktrace mainly focuses on M&A deals for SME’s. Therefore, quite often a family business is involved. Such a transaction is a huge deal for the family, so every tiny detail has to be 101% perfect. We also encounter many market leaders in niche-markets. These are the firms I find the most interesting, as you get insight into all of the firm’s competitive advantages and the road to their success. The quality and quantity of information is rather limited compared to publicly listed firms or the case studies we make in university. This requires thorough analyses and you frequently have to contact the management for an explanation or additional information. I was really surprised how helpful the CFO of a company was, the first time I sent her my list of questions and needs. This is what makes M&A so exciting for starters: the clients and partners you work with/for are always at executive level, meaning you have to be continuously sharp and make sure you are well prepared. Currently I am involved in 4 projects in various sectors (construction, industrial, energy, and retail). In general, the senior is fully in charge of the project and handles the most complex phases, like deal structuring, contracts and negotiations. My main responsibilities are making information memoranda, valuations, long lists, business tools, such as sector overviews or models. Two weeks ago we entered the market with one of the companies by approaching potential acquirers. This is always an exciting moment because you finally receive feedback on your work from the market/investor. If the information memorandum is not appealing (or not complete enough!) to the investors, or when you have selected the wrong firms in the long list, then it will be more difficult to find the right acquirer. I am looking forward to working on all the interesting projects that are coming up this year and of course to the first two (business) trips to Dublin and Warsaw. Lastly, I would like to thank you for your interest in reading this article and express my hope that you found it useful and enjoyable. 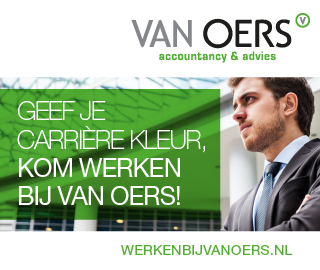 If you have any questions, please do not hesitate to contact me by email (gijs.van.de.wetering@blacktrace.nl). My name is Lars Smits, I am 25 years old and I was born in Kaatsheuvel. I graduated with my masters of Accountancy in Juli 2015, and therefore, unfortunately, the student life has come to an end.